A month after his party suffered a shocking electoral upset, British Columbia New Democrat Leader told party members that he takes responsibility for the debacle. Adrian Dix faced the party's provincial council on Saturday, at a meeting to be almost completely dominated by a post-mortem of the May 14 election. "We had expected, we wanted, we were told we were going to win, and we didn't and that is a devastating and heartbreaking thing," Dix told the council. "It is a heartbreaking loss, and I am the leader of the NDP and I take fully responsibility for that loss." Dix said the New Democrats must embrace the lessons of the failed campaign -- a process that has been going on for weeks and will continue at least until a general convention in November, where he will face a leadership review. Though his political future has been the topic of much speculation since election night, Dix remained determined that he will stay at the helm unless members decide otherwise this fall. "I could have been better in the campaign, and that will stay with me for a long, long time," Dix told the dozens of deflated regional representatives gathered in the basement of a downtown Vancouver hotel. He blamed the Liberal victory on the loss of good-paying, blue-collar jobs under their governance. 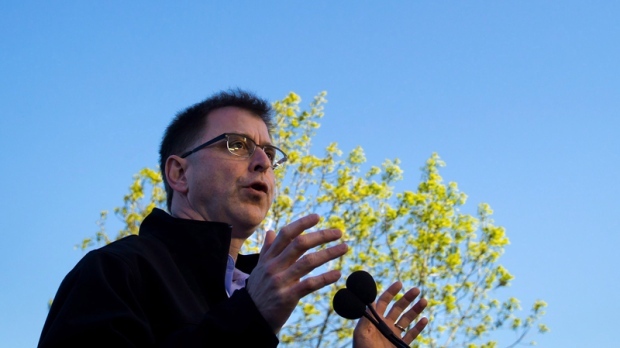 "When you lose 40,000 forestry jobs in 10 years under the Liberals, it actually helps the Liberals win elections because those people who have been the bulwark of NDP support, particularly in the Interior, are not there," Dix told delegates. But he acknowledged that some of the blame must be directed in-house, including a failure to make their case during the campaign that the Liberals were not worthy of another term in office. The New Democrats didn't communicate their vision in a direct-enough way, and their campaign didn't resonate with those who would have benefited from the changes they planned, he said. "The positive message that we put forward about change did not resonate with those that it needed to resonate with, and we have to acknowledge that," he said. He also offered a mea culpa to the council members for announcing his opposition to an oil pipeline proposed by Calgary-based Kinder Morgan, saying it took away from a core focus the party had been planning for months around creating family-supporting, good-paying jobs. "Our better agenda for jobs was lost somewhat in the debate around Kinder Morgan, and... because of the way we handled the issue, we didn't actually have the debate that British Columbians needed to have about pipelines," he said. Dix received a standing ovation at the end of his speech. Outside the meeting, which was closed to the media, Dix said his focus will be on an effective Opposition to B.C. Premier Christy Clark and her Liberal government. The Liberals were elected on a platform "steeped in duplicity," he said, vowing to hold the government to account for their promises as soon as the legislature resumes next week.